3 out of 5 spooky stars. There’s a ghost that appears in the haunted house ride of an amusement park in the 1970s? Jinkies! Is this a Hard Case Crime book or an episode of Scooby-Doo? Actually, it’s a Stephen King novel. And as we found out the last time Uncle Steve wrote a book for the HCC line, he doesn’t have a problem with blurring the line between crime and supernatural. Since HCC needs all the help it can get, I’m pretty sure nobody bitched too much when he turned this one in. Devin Jones is a struggling college kid looking for a summer job in 1973, and he lands a position at Joyland, a third rate amusement part in North Carolina. Poor Devin gets dumped by his first love shortly after starting work, and he spends a good part of the summer brooding over his broken heart. But it’s not all bad. 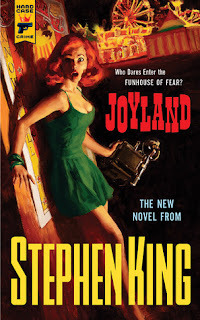 Devin enjoys the atmosphere at Joyland which is populated with colorful carnies who show him the ropes, and he manages to make some friends as well as develop a talent for entertaining kids. The park has a dark side in its haunted house where a young woman was once murdered, and her killer was never caught. Some claim to have seen her ghostly form. Zoinks! As a Stephen King story, this is pretty good. It’s told from the perspective of older Devin looking back to a summer of his younger days and King has the melancholy tone of faded youth down cold. Devin’s a likeable character and the ghost in the spook house thing isn’t overdone. It mostly hangs in the background as Devin tries to get over being dumped and learning the carnie trade. It’s obvious that the behind-the-scenes stuff at the amusement park is the idea that King really got into and he even goes so far as to create a whole bunch of carnie lingo on top of the actual stuff he used. The early ‘70s setting gives the whole thing a bit of vintage charm although there are more than a few seemingly anachronistic tidbits. Were microwave ovens available and affordable enough then that a kindly landlady would have one? Were fruit smoothies a regular breakfast beverage back then? Wikipedia tells me that it’s possible, but it really doesn’t feel like they’d be commonplace. Plus, I really had a hard time believing that the owner is so forward thinking as to ban smoking in his amusement park. Devoted Hard Case Crime fans might grumble that this isn’t really a crime story. While Devin is fascinated by the ghost story and has a friend dig up some research on the murder for him, there’s really no active effort by him to try and solve the case. It’s really more of a bittersweet coming of age story with a little murder and spooky happenings around the edges and providing a wrap-up. Still, it’s an entertaining tale in an off-beat setting with one of the most famous story tellers of our time. It’d be a great diversion to read while you’re standing in line to get on a roller-coaster.